On August 15, 1961 the New York Giants obtained QB Y.A. Tittle from the San Francisco 49ers in a trade for Lou Cordileone, a 23-year-old lineman. The teams had played each other just days earlier and Tittle had nearly pulled out a win for the 49ers, the Giants coming away with a 21-20 victory. Yelberton Abraham Tittle was 34 years old and a 13-year pro veteran. He had come out of LSU to join the Baltimore Colts of the All-America Football Conference in 1948 (they picked him up from the Browns, who originally signed him, as part of the league’s “lend-lease” program to help spread talent to weaker clubs) and broke in impressively. He beat out veteran Charley O’Rourke to start and was among the league’s passing leaders while the Colts tied for first in the weak Eastern Division, losing the resulting playoff to Buffalo. The team played poorly in 1949, however, and taken into the NFL in ’50, was even worse yet. The Colts disbanded and Tittle’s rights were obtained by the 49ers. San Francisco had an established veteran quarterback in Frankie Albert, and Tittle backed him up for a full season before moving into the starting lineup during 1952. For the next eight years, the bald-headed quarterback who looked more like the insurance agent that he was during the offseason than a star NFL signal caller was highly productive with a team that often contended in the competitive Western Conference and tied for the division title in 1957. He was named to the Pro Bowl four times and received league MVP honors from UPI in ’57. San Francisco had outstanding running backs during that period, with FB Joe Perry and halfbacks Hugh McElhenny and John Henry Johnson the most noteworthy, as well as fine receivers in ends Billy Wilson, Gordie Soltau, and R.C. Owens. With Owens, an outstanding jumper, Tittle developed what became known as the “Alley-Oop” play, a high arching throw that Owens, out-leaping the opposing defensive backs, would grab in key situations. Tittle overcame injuries along the way, such as a triple-fracture of his cheekbone in a game against Detroit in 1953 and a broken left (non-throwing) hand in ’54. He was also an enthusiastic team leader who was quick to display his emotions on the field. Using a long stride and three-quarters sidearm delivery, Tittle’s passing mechanics were somewhat unorthodox, but certainly effective, and he was both patient and fearless in the pocket. At the time of the trade, his career completion percentage of 55.3 was the best among active NFL quarterbacks. Having suffered through an injury-plagued 1960 season and, with Head Coach Red Hickey committing to a shotgun offense, Tittle no longer was a fit with the team. John Brodie, San Francisco’s first draft choice in 1957, had been developing while in the backup role and was joined by the more mobile Bill Kilmer and Bob Waters. Tittle initially questioned whether he would report to the Giants, as he had an insurance business in California, but shortly thereafter arrived in camp. Allie Sherman, the new head coach of the Giants, indicated that Tittle would “fill the gap” between 39-year-old veteran QB Charlie Conerly and untested prospect Lee Grosscup. Another trade brought split end Del Shofner from the Rams, which added a quality receiver to the mix. The close-knit Giants players were initially standoffish toward Tittle, and it wasn’t helped when he went down with an injury almost immediately after joining the team. He started the 1961 season as a backup to Conerly, but in Week 2 against the Steelers he came into the game, completed his first eight passes, and the Giants won. Tittle passed for 315 yards the next week against the Redskins and became the starter as the team returned to the top of the Eastern Conference, losing badly to Green Bay in the NFL Championship game. For his efforts, Tittle was selected to the Pro Bowl and received MVP honors from the Newspaper Enterprise Association. Conerly retired, Grosscup was let go, and Tittle went on to have a bigger year in 1962, tossing 33 touchdown passes to set a NFL record (the AFL’s George Blanda compiled 36 in 1961). He had a 505-yard, seven-TD performance against Washington along the way. The Giants again topped the Eastern Conference at 12-2, although once again they fell short against the Packers. Tittle was a consensus first-team All-NFL as well as Pro Bowl selection and again received league MVP honors, this time from UPI. The Giants won a third Eastern Conference title in ’63 and Tittle again achieved MVP (AP, NEA, Sporting News), All-NFL, and Pro Bowl honors while breaking his own league record with 36 TD passes and leading the league in passing overall. But torn knee ligaments suffered during the Championship game against the Bears hampered his performance. In perhaps the bitterest defeat of all, Tittle tossed five interceptions, two of which set up Chicago touchdowns, and the Giants came up on the short end by a 14-10 score. “The Bald Eagle” returned for one more year in 1964, attempting once more to finally achieve the elusive NFL title, but time ran out for him and the Giants. The team crashed to last place with a 2-10-2 record and Tittle, battered in some of the defeats, found himself splitting time with rookie Gary Wood. It marked a miserable end of the line for the 38-year-old quarterback. At the time of his retirement, Tittle was the NFL all-time career leader in pass attempts (3817), completions (2118), yards (28,339), and TD passes (212). Whatever his shortcomings in the postseason, he had been a highly productive passer for many years, especially during his first three seasons in New York. 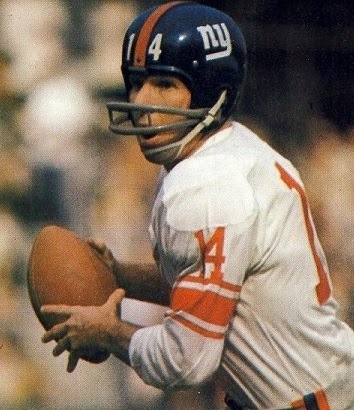 The Giants retired his number 14 and he was inducted into the Pro Football Hall of Fame in 1971. As for the player that the Giants gave up for Tittle, Lou Cordileone was New York’s first draft choice in 1959, coming out of Clemson. During his rookie year, he saw action as both an offensive and defensive lineman. The 49ers hoped that he would develop into a solid player, but he lasted one year in San Francisco and became a journeyman thereafter, finishing up with New Orleans in 1968.